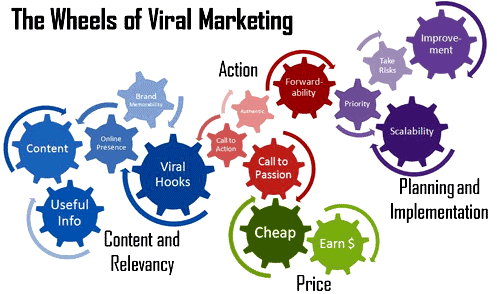 Viral Marketing is a marketing strategy that focuses on spreading information and opinions about a product or service from person to person, especially by using unconventional means such as the Internet or e-mail. Viral marketing relies on and encourages people to pass along a marketing message by word-of-mouth marketing. It may use blog and social networks to produce positive word-of-mouth brand awareness. Let’s go through the case study below to find out how big brands have been using viral marketing as a great tool to not only promote their business but also to build their brands by creating a better relationship with the audience and increasing the trust factor. Why Viral Marketing Works Wonders? We often talk about trust, quality, social action and content with impact, and they can change the fate of your business. Viral marketing is one such junction that helps you utilize all these with minimal or no investments and brings your business a result that works quicker and is long lasting. Still, let’s have a look to some concrete ways it helps your business. You only need to create a good piece of content whether it is a video, image, infographic or just anything that gives value and can unleash the interest (emotion) of your target audience, and here you get the visibility increased for your business to an extent that is hard to believe as the more people share your content, the more it contributes to your SEO. Besides, through the word of mouth marketing your brand building also gets a big boost. Obviously, if a lot of people get positive views about your business it is sure to reinforce your brand’s reputation in the market that will in turn improve your good will and an improved goodwill accounts for more repeat customers and not just the newer ones. In this digital era, when customers almost can’t tolerate any other marketing but the inbound marketing, viral marketing is a wonderful way to increase sales for your business as the of the above factors account for a better conversion rate than any other way can. You just initiate a wise content marketing campaign, and it keeps giving you results all the way down the line. Consumers come to you rather than you approaching them, which make viral a marvelous marketing. Coca-Cola made a new record in the field of viral marketing when its latest online video campaign ‘taking Cannes by storm’ got 1.5 million YouTube views during the process. The campaign featured a ‘Small World Machine’, linking Indians and Pakistanis via a live communications portal. The viral, featuring Indians and Pakistanis interacting with each other via the coke vending machine, was created by Leo Burnett Sydney for Coca-Cola. It placed two camera equipped machines set up in Lahore and Delhi. A fact that cannot be denied is that despite the two countries share historical and cultural links, their borders divided by barbed wire with both sharing mutual hostility and suspicion. This ad from Coca-Cola tried breaking down these barriers with new technology to share common interests in a fun way. The best thing about the ad was it created a situation that acted as the key to engaging with each other through the machines as it made the people in India and Pakistan to complete a task, like touching hands, drawing peace, love, and happiness symbols together. Moreover, to capture a live emotional exchange like this, 3D touchscreen technology was used by the firm to project a streaming video feed onto the vending machine screen while simultaneously filming through the unit. This is how the machines encouraged shoppers in New Delhi to ‘make a friend in Pakistan’ while mall goers in Lahore were asked to meet someone from India. What made the Video to go Viral? The project tried connecting people who are not exposed to each other on a daily basis, enabling the common man from two closer(geographically) yet far(politically) places to see and interact with each other as you can see how the common man in Lahore can see and interact with the common man in Delhi. Although a small step but a great one taken by Coca-Cola to signal what’s possible.